season 2 | Randomwhoness: a Doctor Who blog by Johnny Spandrell. Sampling stories in random order. We’re supposed to be surprised; this is Doctor Who’s first shock twist. It’s all in the title: Planet of Giants. We’re meant to think our heroic time travellers have landed on an alien planet. It’s only half way in to the first episode that we’re let in on the secret: this planet of giants is Earth! And then there’s that beautiful shot pulling back from the TARDIS, seemingly in a ravine, to show it’s actually miniaturized and parked between paving stones in a garden path (up which we’ve just been metaphorically led). It’s an odd story this one, the ninth they ever made. It’s the realisation of an ambition the production team had had since Doctor Who‘s initial conception, to do a story where the TARDIS crew are miniaturised. But you get the sense that they gradually lost enthusiasm for the idea. They left it until nearly last in the season. Then they abbreviated the story from four episodes to three, when they realised it was getting a bit dull. I suspect that as the story developed, the technical difficulties which presented themselves started to impact on the fictional world. Someone pretty early on must have realised that the mini TARDIS crew were not going to be able to interact with the full size characters. So this demands parallel story lines in the macro and micro worlds, which presents a whole raft of new difficulties. The micro world is recognisable as standard Doctor Who; our heroes are thrown into a bizarre world populated by monstrous creatures and ever present dangers. But the full scale world, from which our heroes are absent, is much less familiar territory. It presents the story of the unscrupulous business man Forester (Alan Tilvern) resorting to fraud, coercion and murder in order to gain government approval for a new insecticide. He’s eventually thwarted by the local telephonist and her police office husband. It’s kitchen sink drama, which doesn’t feel at all like Doctor Who. So cutting between these two worlds has the effect of watching two different programs simultaneously. 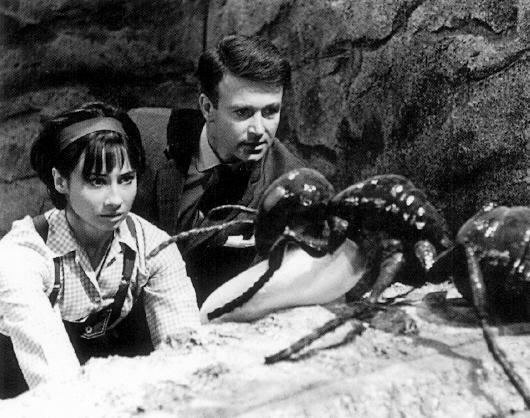 Given better technical facilities or a larger budget, the story would save a crew member from miniaturisation (Carole Ann Ford’s Susan, perhaps) in order to be the conduit between the two storylines, and aid our engagement with both. But as it is, there are two plot elements which link these worlds. First there’s the murder of fussy, scrupulous old public servant Farrow (Frank Crawshaw), whose body the time travellers come across in the front yard. The second is the insecticide DN6, the results of which our mini heroes see all around them in the yard; ants, earthworms and flies lay lifeless. These two factors help the Doctor (a legitimate William Hartnell) and co make the not exactly impossible, but highly improbable leaps of logic to determine that DN6 is a danger to mankind to which they need to draw attention. It’s all very coincidental: Ian (William Russell) and Barbara (Jacqueline Hill) hide in a briefcase, which gets taken to a laboratory bench upon which there’s a notepad with the DN6 formula scribbled on. It’s from this, a few odd smells and the observation of those corpses, both insect and human, that they just about deduce Forester’s plan. Sherlock Holmes could have some competition. But they have nothing on telephone exchange maestro Hilda Rowse (Rosemary Johnson). She’s a wily old eavesdropper and amateur sleuth. Her suspicions are raised when she hears Forester impersonating Farrow on a call to his Ministry. To be fair, Forester doesn’t go to elaborate lengths to disguise his voice; he simply puts a handkerchief over the mouthpiece and hopes for the best. Moriaty, he aint. It’s certainly not enough to fool forensic old Hilda. Then when the phone is off the hook for a while, she gets even more suss and sends husband Bert (Fred Ferris) to investigate. I hope they solve other crimes around their village. There’s a spin off series gone to waste: The Hilda & Bert Mysteries. They solve telephone related crimes! Midsomer Murders before its time. While all this is going on, our heroes have an additional problem. Barbara has touched some DN6 and it’s slowly killing her. Much time is taken up by Barbara attempting to conceal her illness from her friends, for no apparent reason. “Don’t make a fuss,” she hisses at Ian at one point. This whole plot point is very strange because it’s so out of character for sensible shoe wearing Barbara to behave in this way. But wondering why she doesn’t just tell them is as futile as wondering how that ‘space pressure’ made the TARDIS shrink in the first place. As soon as they deduce what’s happened to Barbara (more detective work) the Doctor and his friends determine to take her back to the Ship. But Barbara’s more concerned with telling the world about DN6. So they come up with a plan to draw attention to events in the laboratory by resorting to vandalism. The plan? Set fire to the lab. The method? They light a handy bunsen burner, with some handy matches and direct it towards a handy pressurised can. Yes, here’s early Doctor Who‘s educational remit on display. You too kids, can rig up a bomb in your own science lab! It’s an unusually violent and highly dangerous tactic for our normally peace loving TARDIS crew. And as fortune would have it (and like everything in this story, timing and coincidence play significant roles), Forester walks in at precisely the wrong moment, and the can blows up in his face. Just think about that for a minute: a heated aerosol can exploding in your face; that’s pretty brutal by Who standards. But there’s no time to dwell on the horrible injuries he must have sustained because seconds after, Inspector Bert turns up. And that’s where we leave the macro story, in the hope that he’ll sort it all out. Well, if he can’t he can always call Hilda for back up. All ends well as our friends return to the TARDIS, and the Doctor hits a reset switch which returns the TARDIS to normal, cures Barbara and shrinks a giant seed for good measure. But no one mentions the elephant in the room: that the Doctor finally managed to get Ian and Barbara back to 20th century England but at a fraction of normal size. Imagine if he’d manage to resize the TARDIS without moving location. Ian and Babs might have decided to jump ship and the Doctor would be looking for two new companions. There would be two obvious candidates. Step inside the spaceship you remarkable crime fighters Hilda and Bert! Now that would be a twist. ADVENTURES IN SUBTITLING: ‘Quick! Behind this water tank!’ cries Ian. A tank on a laboratory bench? Doesn’t he mean ‘water tap’? But anyway, my favourite is when Hilda picks up a call and says ‘Exchange operator’, the subtitle say ‘Strange operator’. Well, she’s a nosy old bird, but that’s a bit harsh. Still, it was a big hit for Sade, wasn’t it? LINK TO Enlightenment: Hmm, will you accept that both feature dead animals? Planet of Giants‘ array of dead insects and those dead birds stuck on the Guardians’ heads? Oh, go on! NEXT TIME… Well done, everyone. We’re halfway out of the dark. Please join me in A Christmas Carol.